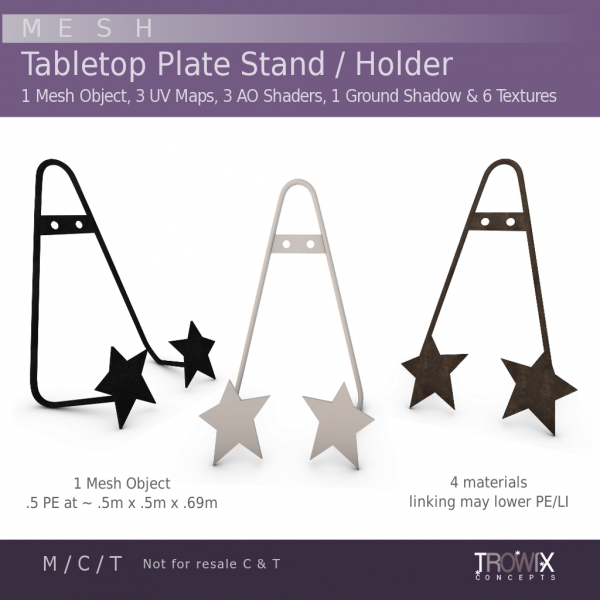 Tabletop Plate Stand – Props to you! A cute little plate or picture frame holder for your primitive, country, holiday and whimsy projects. Great for tables, mantles, shelves and bookcases. Cast iron new and rusty baked textures included. Original mesh made just for SL grid with extremely low prim equivalency (PE or LI) and 4 materials / faces for many creative texturing options. 6, 7, 8 Sided Frames – Picture it! 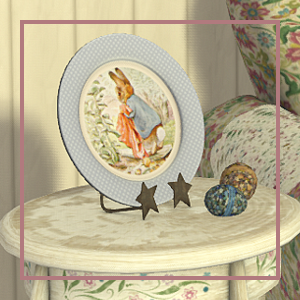 3 versions of multi-sided frames popular in the Victorian era and ready to add just the right finishing touch to your vintage and shabby builds. 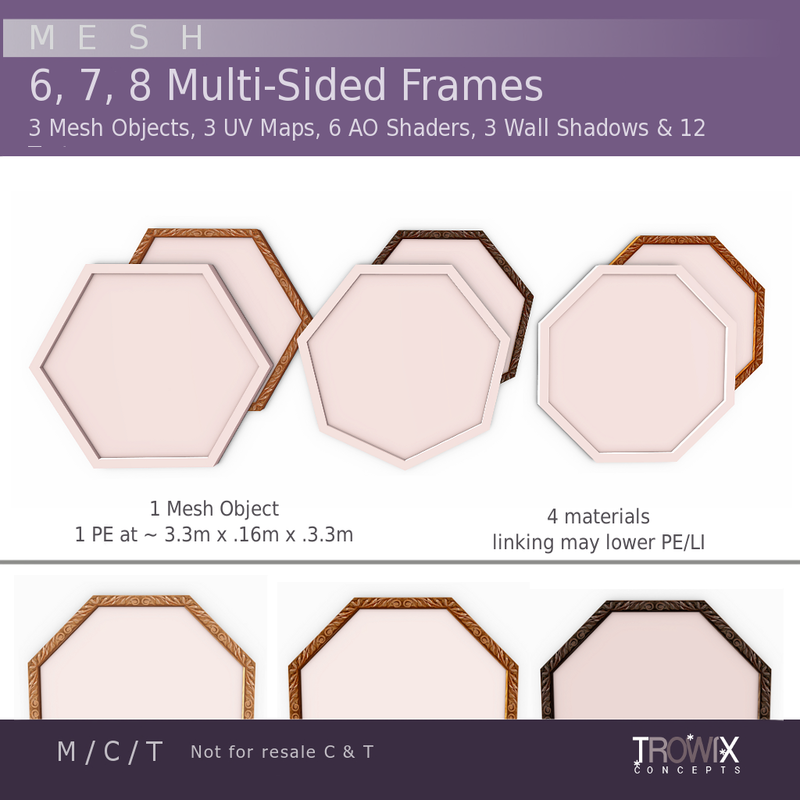 Original mesh made just for SL grid with extremely low prim equivalency (PE or LI) and 6 materials / faces for many creative texturing options. Baked carved wood-look frame textures and wrinkled paper backs add to the antique charm. Or make your own with our inclued AO and UV maps. Easy to texture and put in your own photo, too. or on SL’s Marketplace, here. I have not blogged our February / Valentine In-World Group Gift until now. It’s still available for a short time. 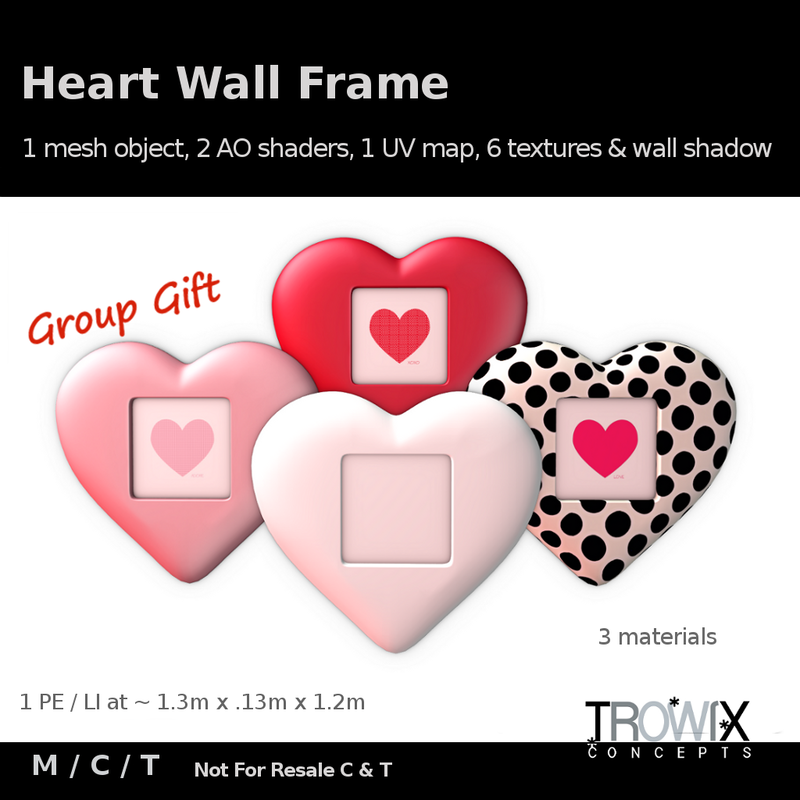 Hand-crafted by Trowa just for you and SL; it is a puffed heart frame so you can show the world who and what you love! It comes with textures if you don’t want to add your own. Spectral and AO Maps. It’s pretty spiffy… and cute! Find this at the Trowix Barn and nowhere else! A very versatile and useful mesh to have in your builder’s toolbox. Perfect for displaying signs, photos, art, textures of all kinds. 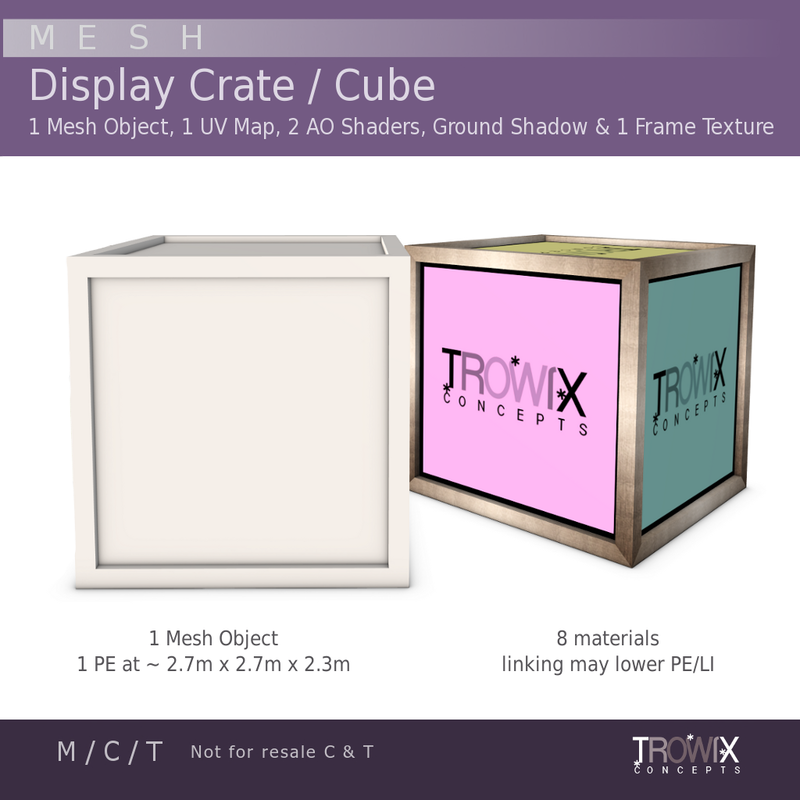 Each side is a separate texturing material + the frame + the ground shadow makes this cube almost better than a prim. 8 materials total – and so much more classy! 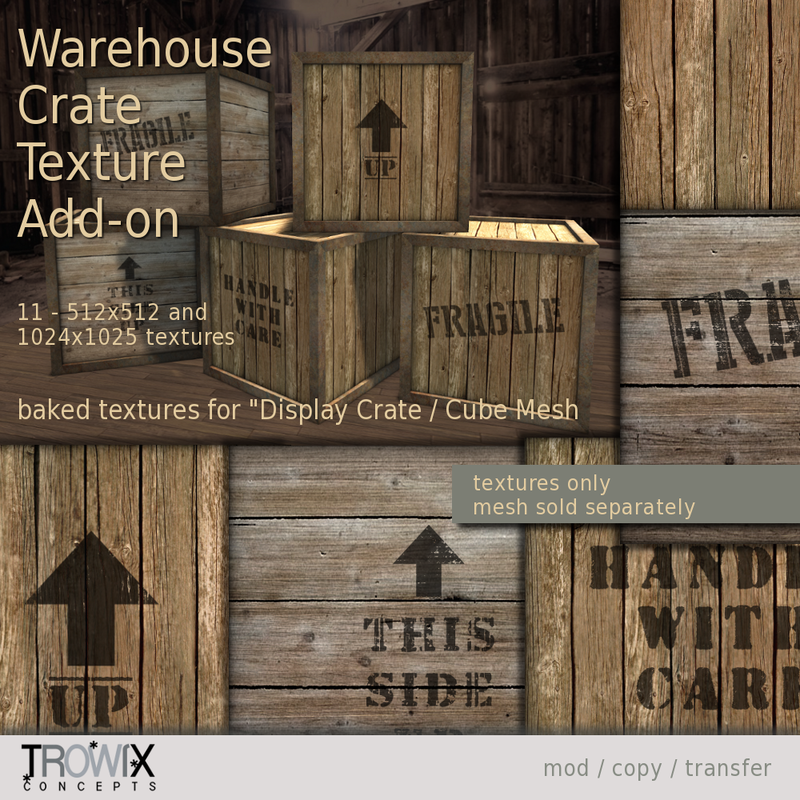 I wanted to use this in the Barn Store so I made a texture pack with crate-like phrases and scruffy woods. One style is 512×512 and the other 1024×1024, just in case you need some snappy rez times. 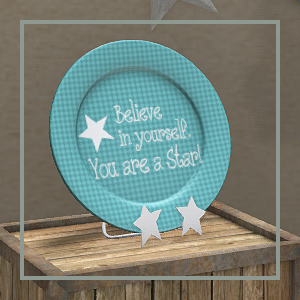 Plain wood textures included so you can put on your own logo or phrase. Please send pictures! Also available on Second Life Marketplace. 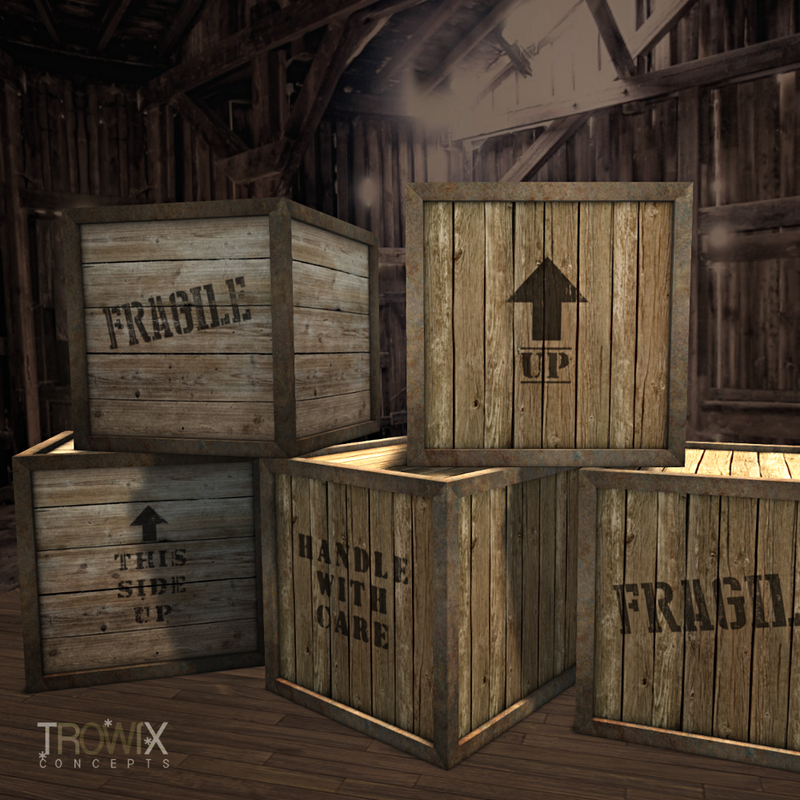 Trowix, crate things for you! 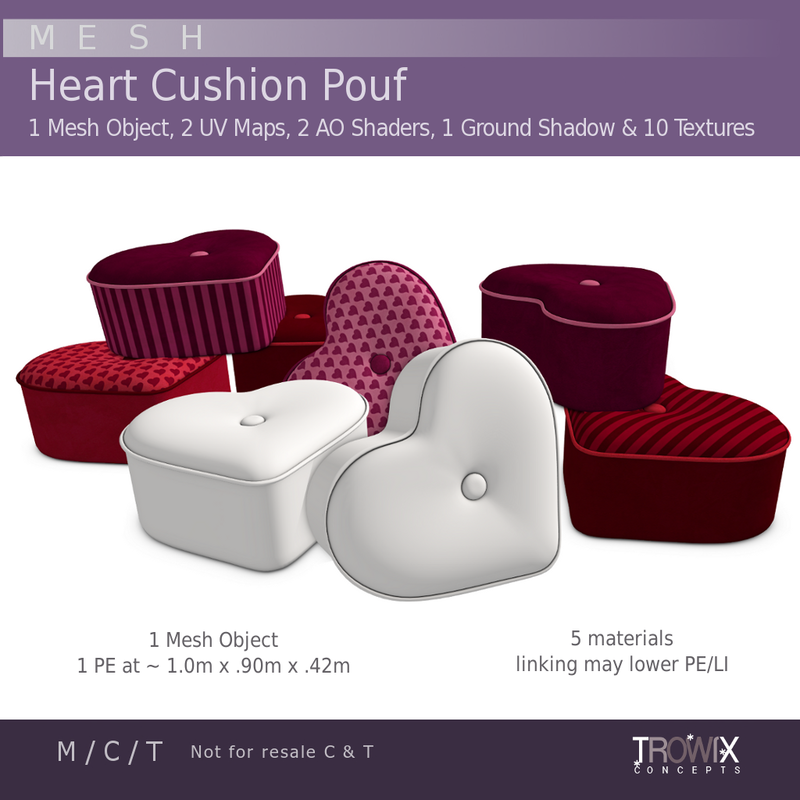 Heart Cushion / Pouf – Darlin’! 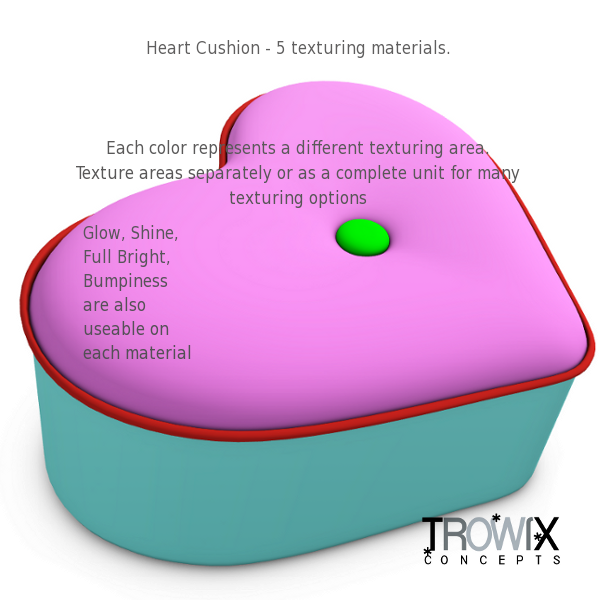 A heart shaped cushion with a retro flair. Cute enough for the pickiest pinup girl. No pinching or crumpling to distort your pretty textures or mix and match our 10 baked textures. 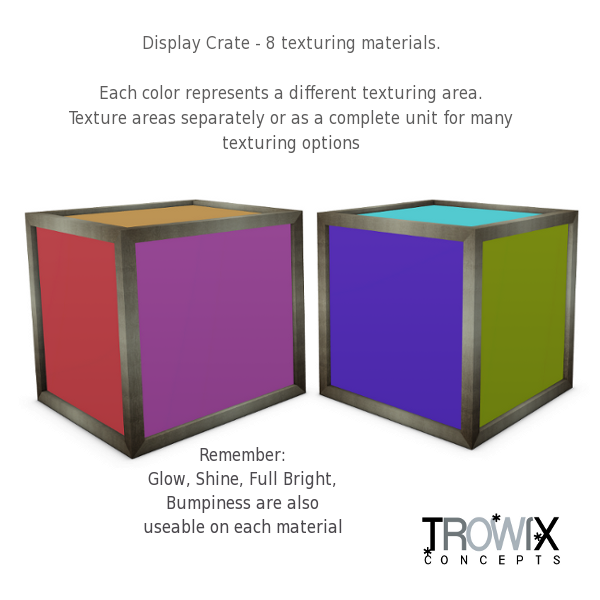 5 materials to make texturing easy and creative. <3! Valentine building goodies for you! New Adult items for your Valentine naughtiness! 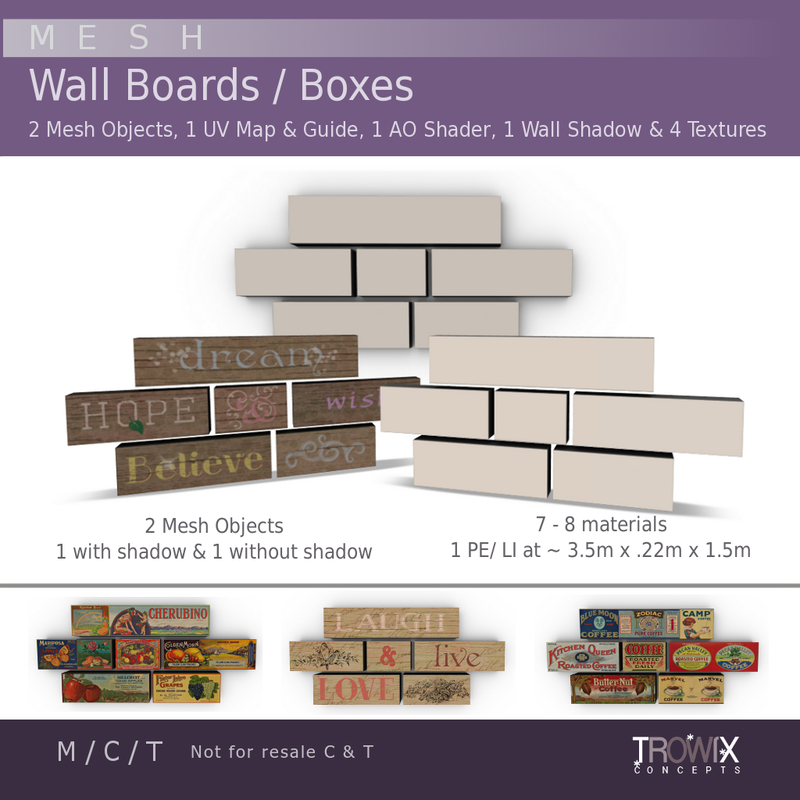 Signs and toys in mesh are available in our Adult Skybox Shop. 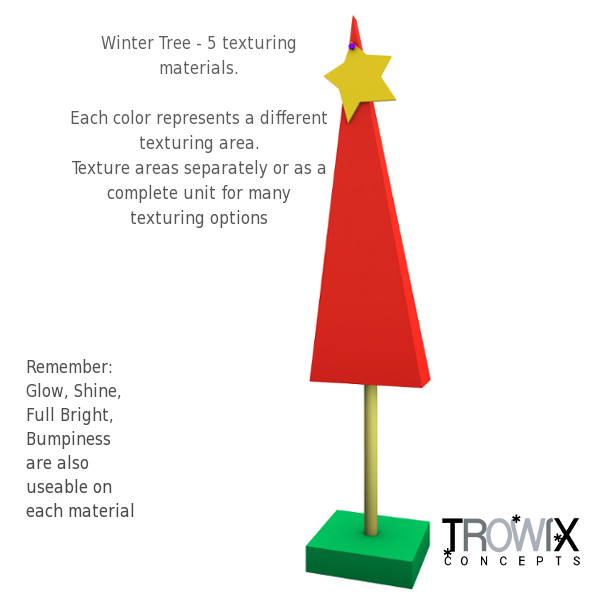 Naughty or nice, Trowix has your building supplies! 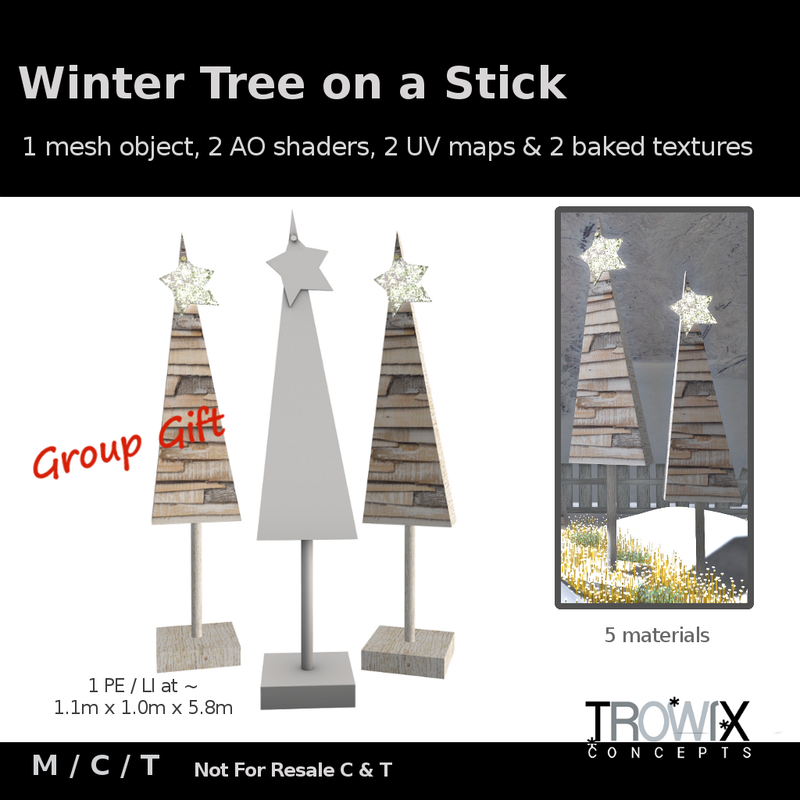 Cute or Elegant, have it either way with this stylishly clever mesh tree Group Gift for your Winter builds and beyond. 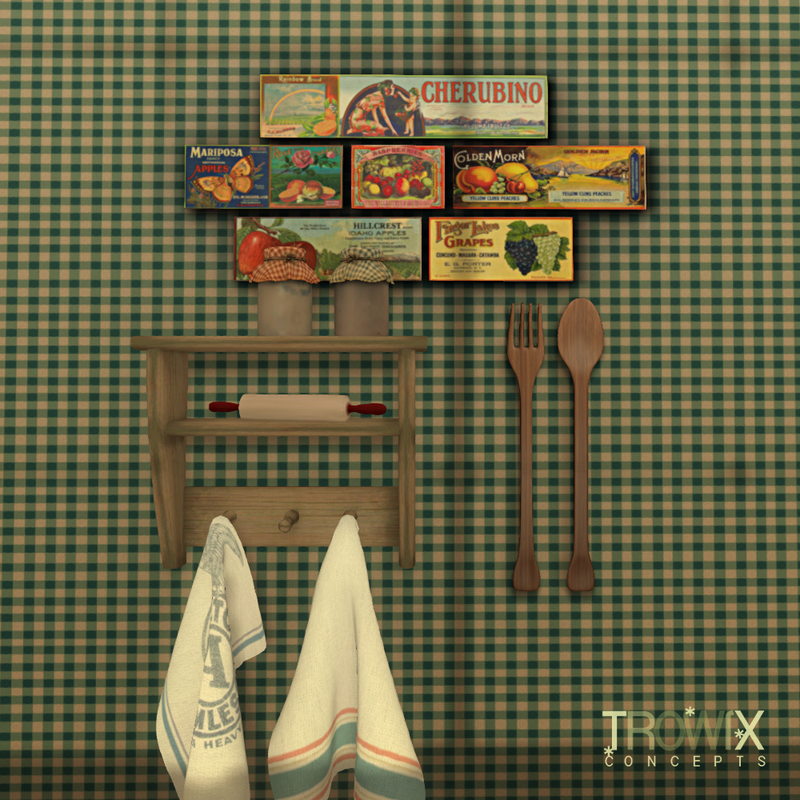 Makes a lovely low prim store display. Original mesh with extremely low prim equivalency (PE or LI). Everything you need for eye-catching building. 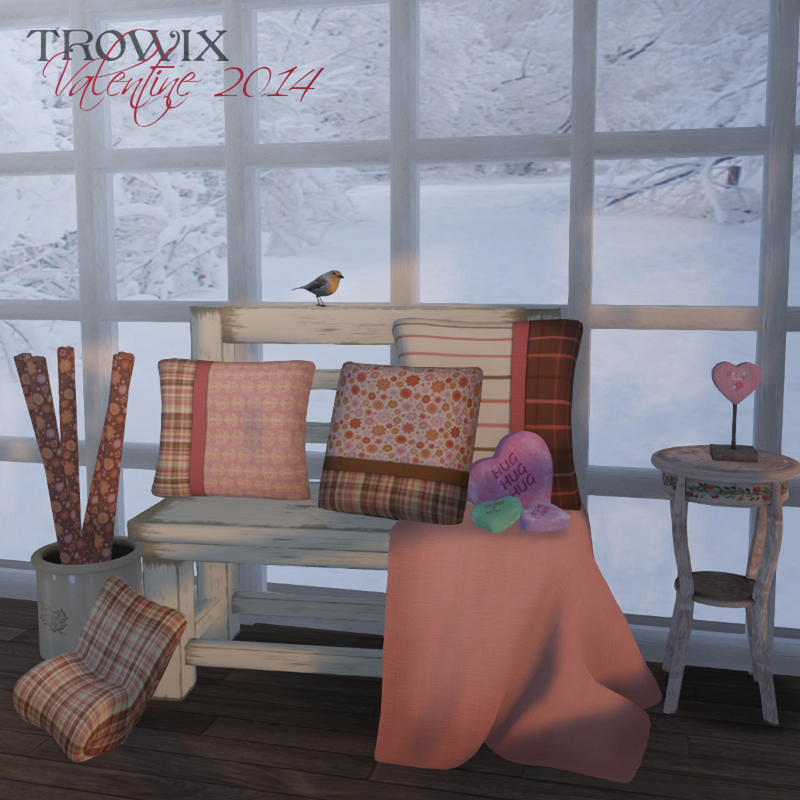 Stop by the Trowix Barn for yours today! Thanks always for your patronage. Love ya! Holiday decorating can be so many prims. 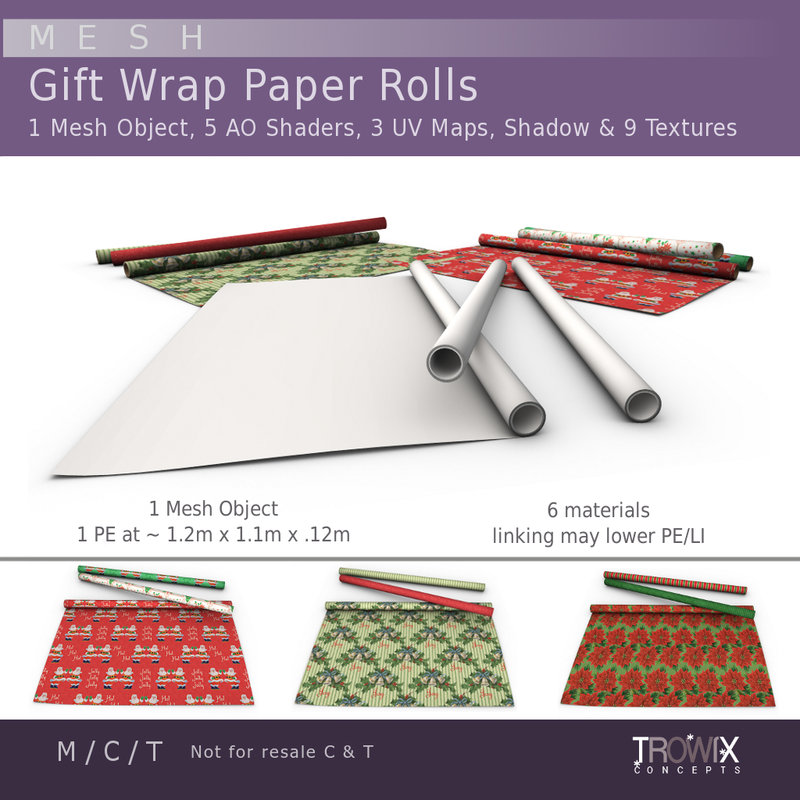 Our newest mesh makes a great addition to your holiday builds for only ONE prim! 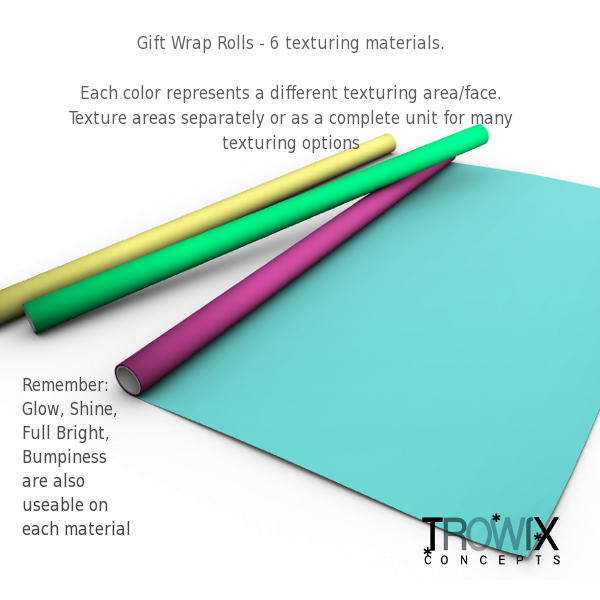 3 highly realistic, beautifully detailed paper tubes for gift wrap, maps, parchments and more. 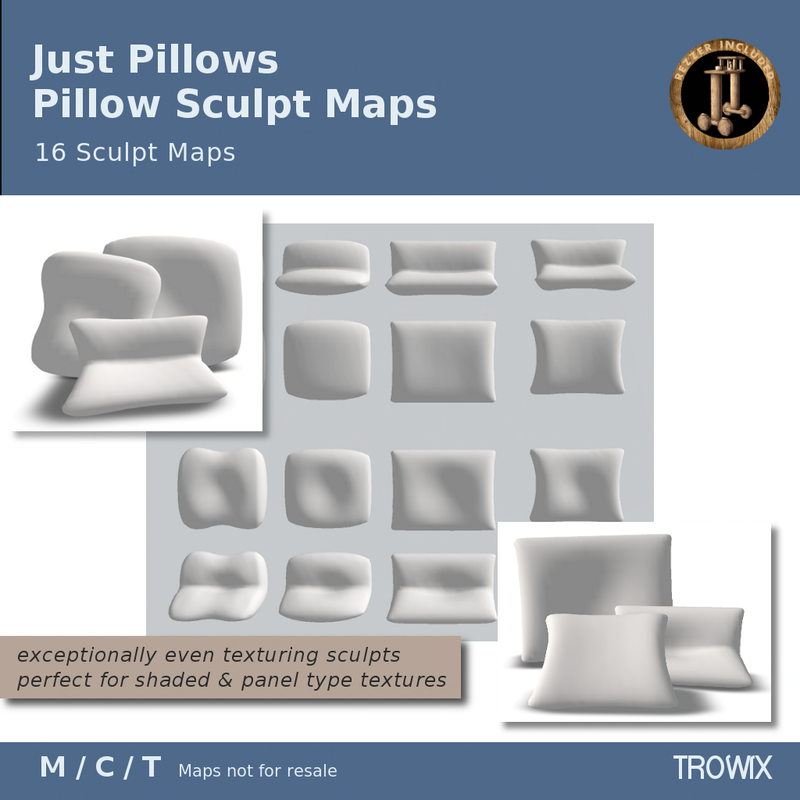 4 sets of mix and match baked textures included or make your own with UV maps and AO. 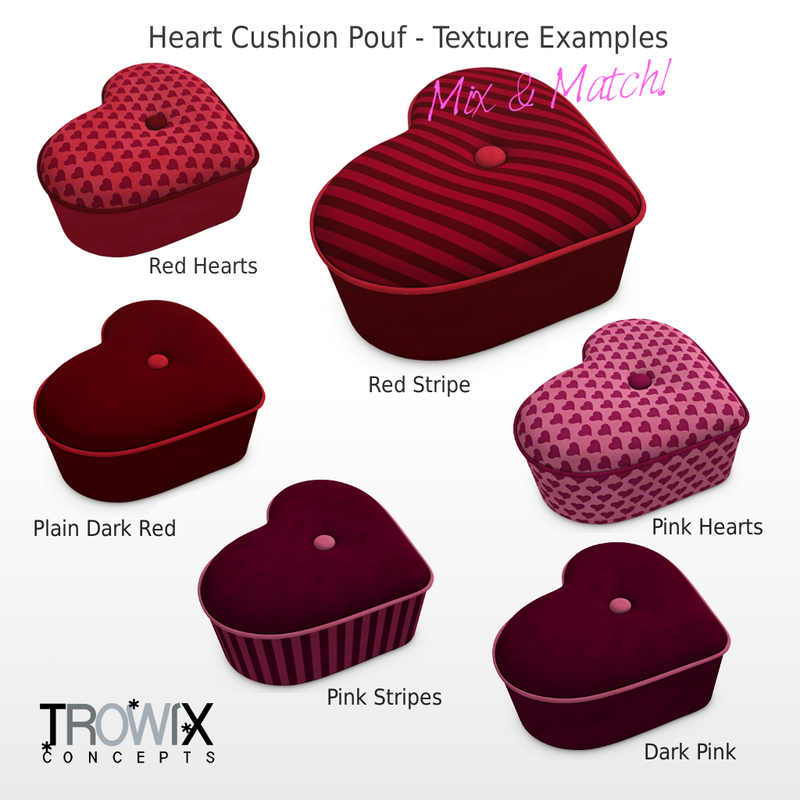 With 8 materials, it’s easy to mix and match the included textures or add your own for your unique look. 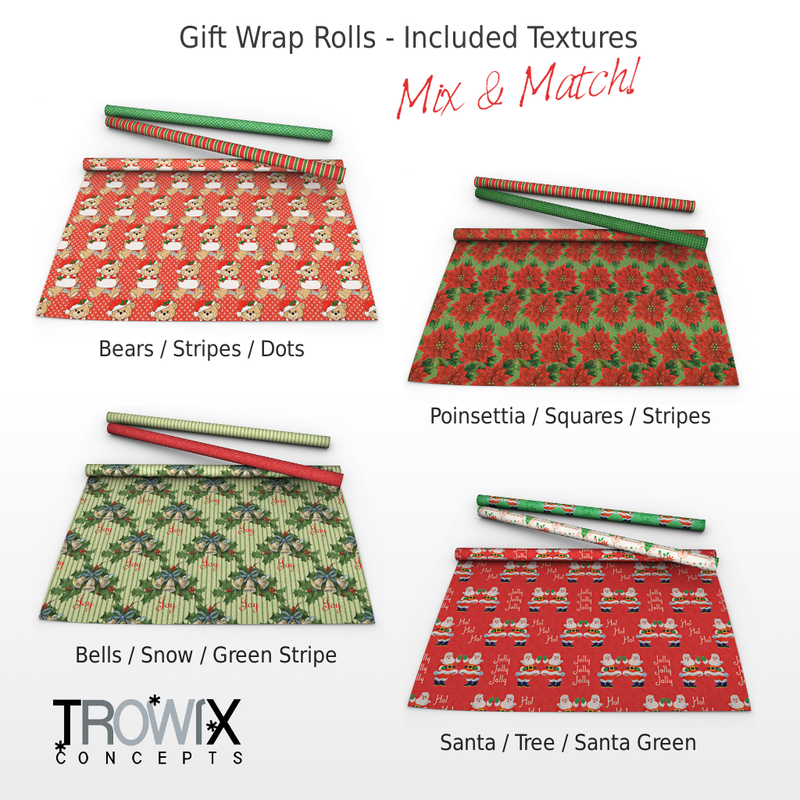 Wrap it all up for the holidays at the Trowix Barn and don’t forget we have matching seamless textures. 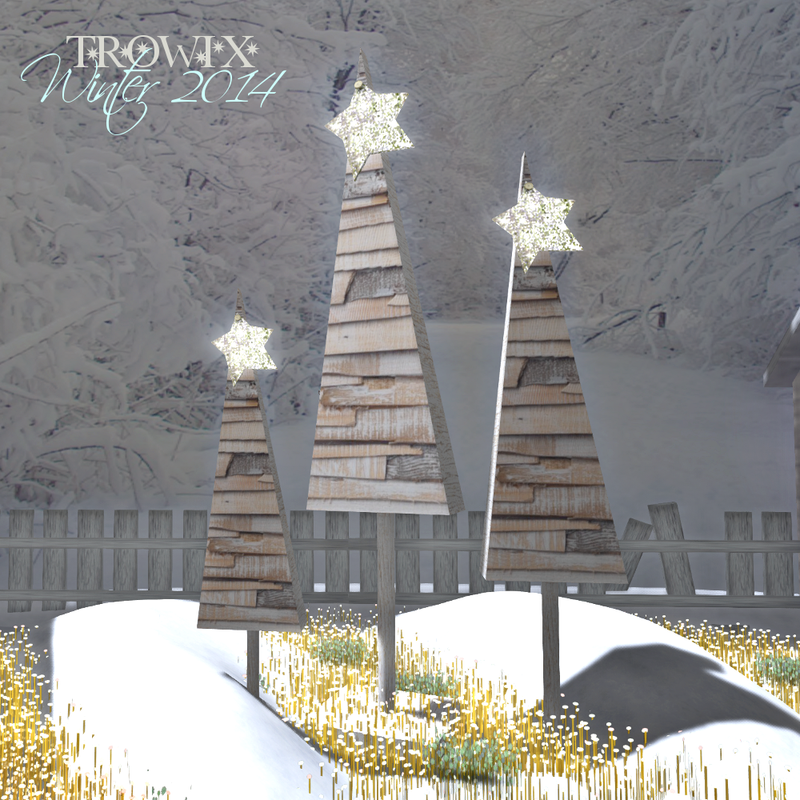 Also available on SL’s Marketplace, here. Pieces of scrap wood make an eye-catching wall display when you can texture them all separately or use our pre-made baked textures. 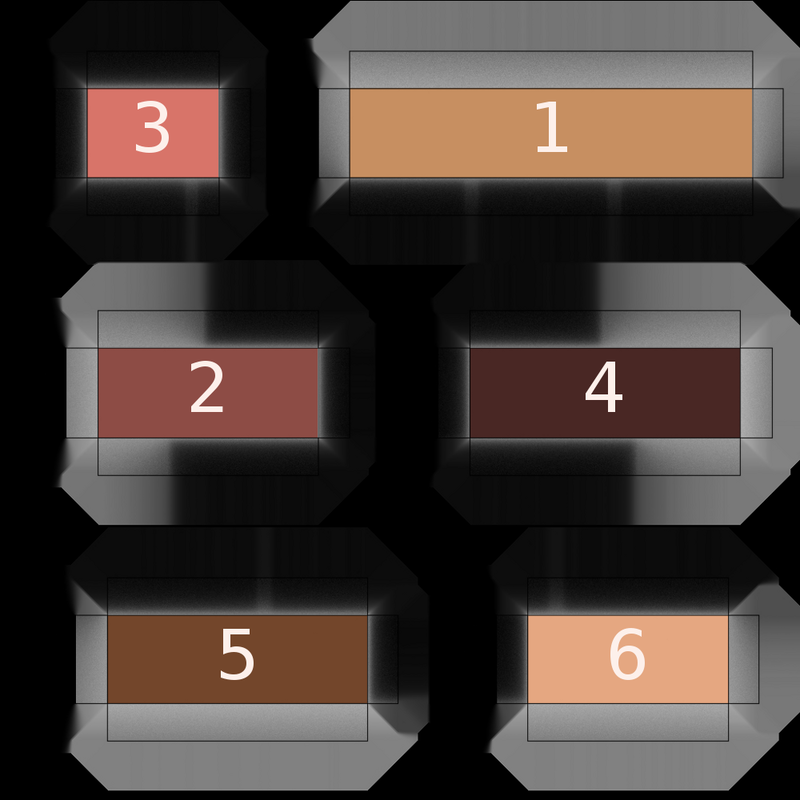 2 mesh objects are included: 1 with the wall shadow/ao built onto it and 1 without the wall shadow/ao. We like to give you choices. Original mesh with AO shader. Extremely low prim equivalency (PE or LI), 7-8 materials and smooth texturing. More choices! 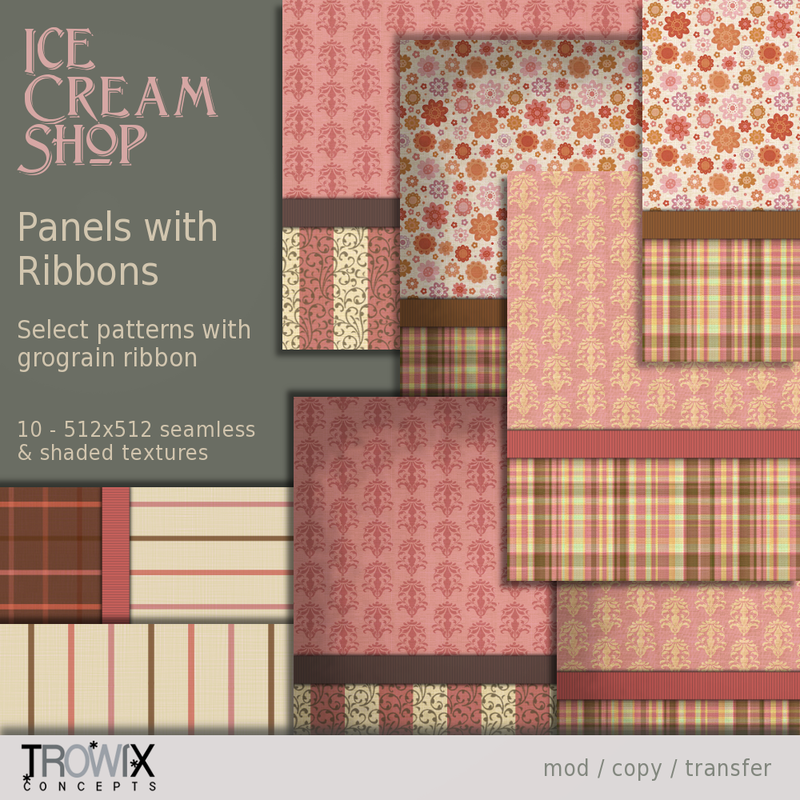 Put a separate texture on each board face – think of the possibilities! Or use our pre-made textures and save on the Mod Podge. Note: This is a mesh object; LI/PE can be affected by size and other variables. 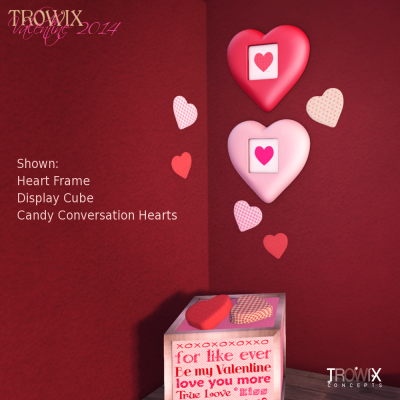 …when you want choices, choose Trowix!